This is a niche in the lower stair hall. I have never been able to get a good image of it as the light from the windows messes with the camera. To the left, through the open door, is the telephone closet (one of my favorite features of the house). The closet has a single, very sweet round stained-glass window. In the niche proper are three arched stained-glass windows (removed in the image). To the right is a vestibule for the north entrance. 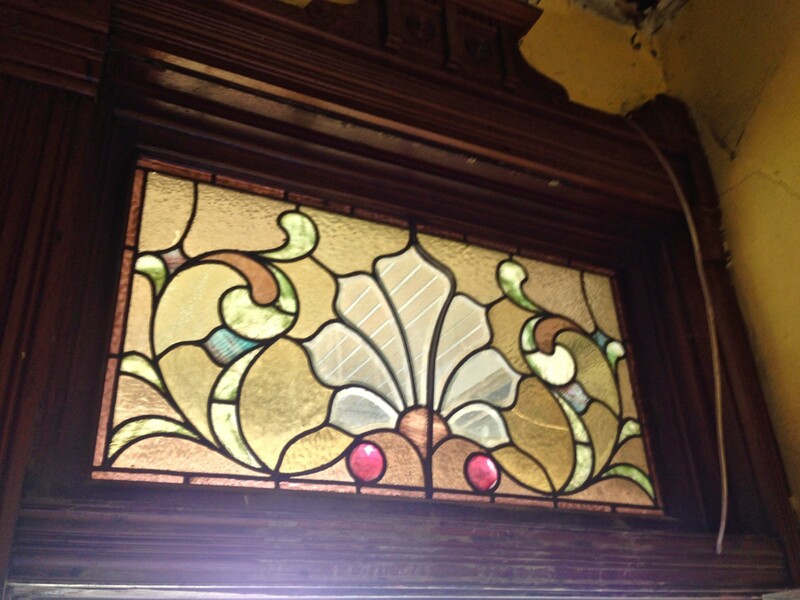 This has a single stained-glass transom above the door. 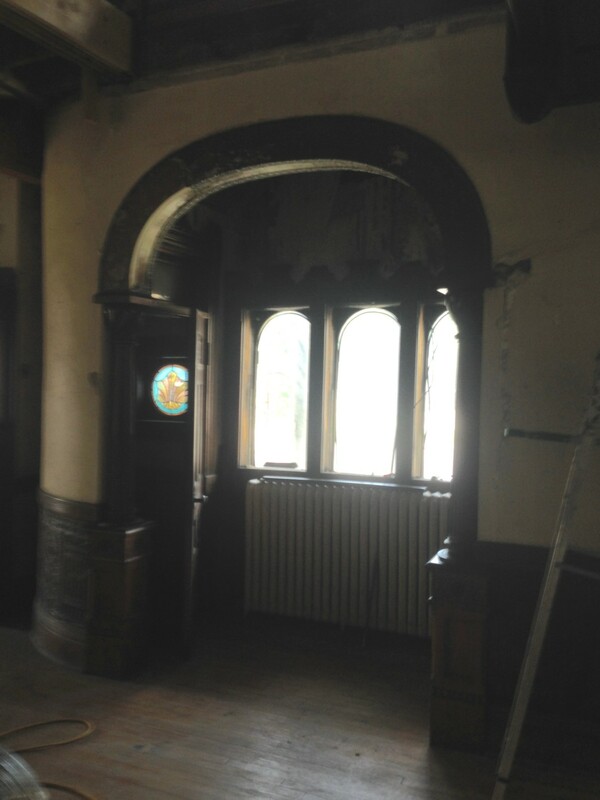 All the stained-glass windows were removed to be restored. 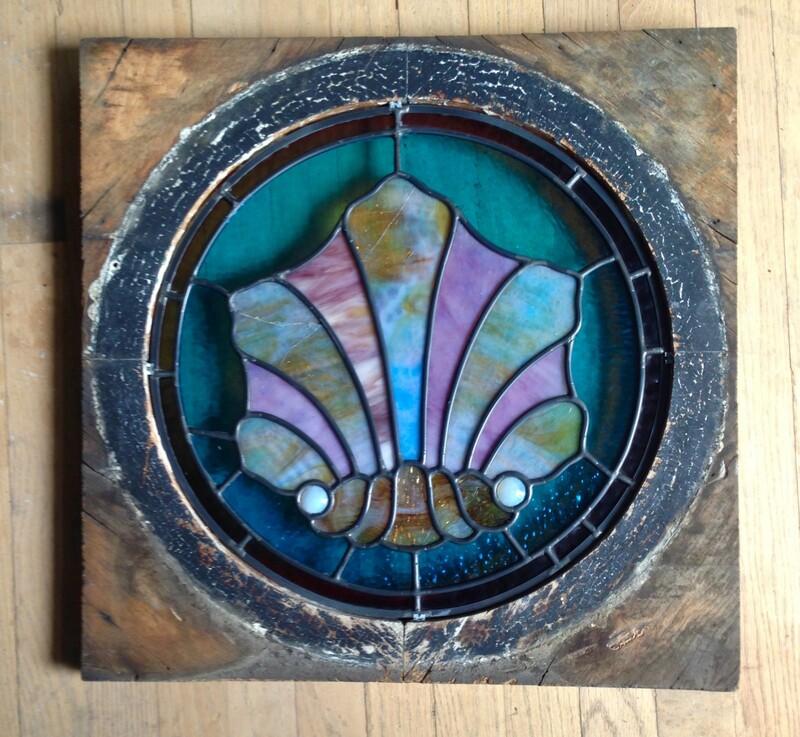 They are shown here at Hoefer Stained Glass. This is the telephone closet window. Pretty desperate. But no longer! Only a single piece of glass was replaced. 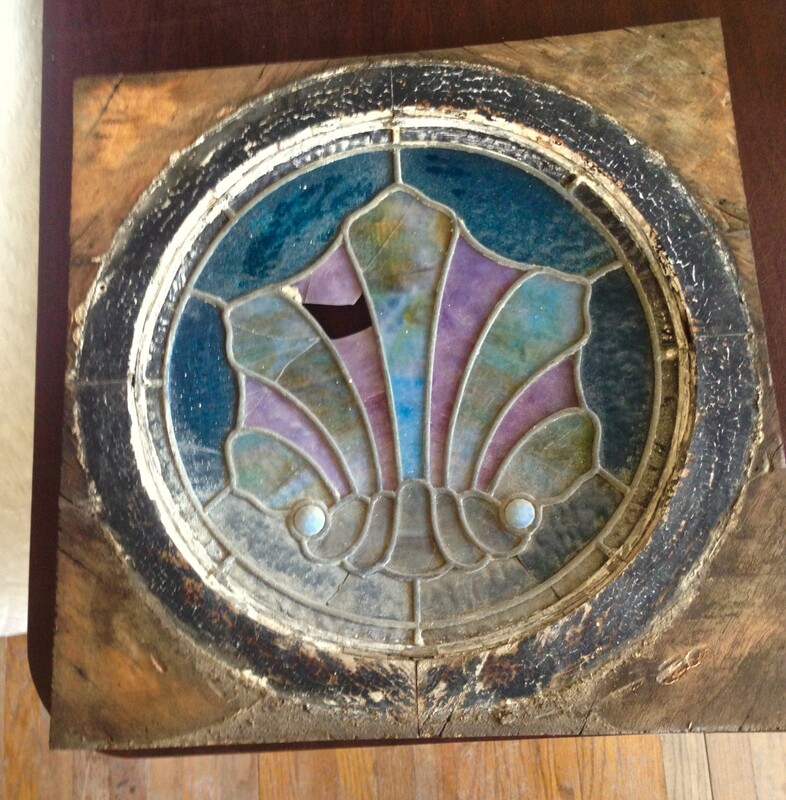 I asked that the cracked pieces be re-glued, as I am keen to retain as much original glass as possible. The three arched windows? Reborn! I have this pair leaning against the library window. That is Jeremy outside, working on one of the gutters. 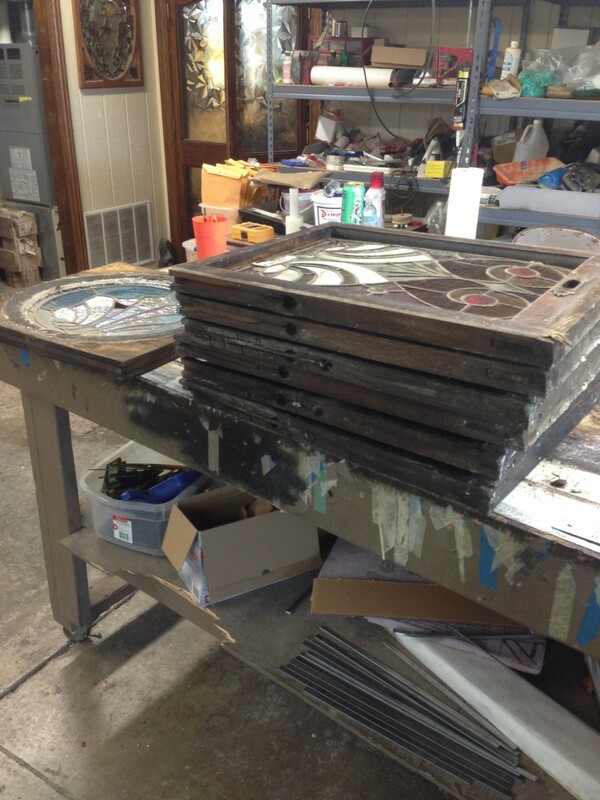 All the wood sashes now need to be restored, the glass bedded, and glazed. When the glazing dries, the sashes will get painted, then re-installed. 5 Responses to More Colorful Renewal! Beautiful beyond words. Tell me, is it the cleaning alone that makes the colors so vibrant? Yes, the cleaning transforms the glass. 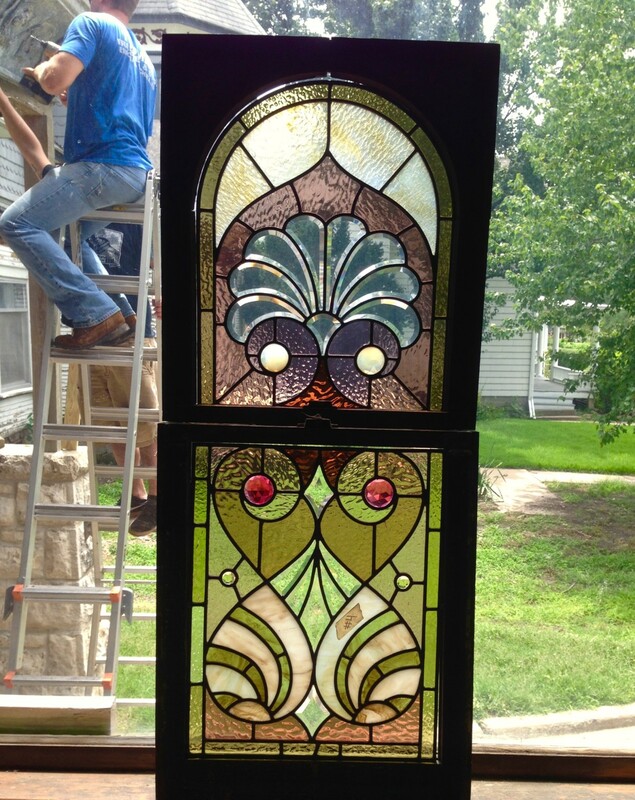 The glass is soaked in a special solution, and this removes 122-years of encrusted grime. I have previously tried cleaning the glass on my own, but get nowhere near the same effect! I’m dying to know exactly what does the inside of a telephone closet look like? Is the original telephone extant? Does it contain a simple bench to sit upon whilst making that all important call? That particular feature is one of the least mentioned in all of your posts and my curiosity is killing me. Please don’t let me die without knowing the answers to my questions. OK, perhaps I am being just a tad melodramatic, but seriously Ross, spill the beans and please tell us more about that darn closet. I really am fascinated by the thing. In the early 90’s we glued a large bathroom window together and it has held all these years. It was a heavily textured glass. People thought we were nuts but it worked.